After several days of legal mediation and weeks of refusing to step down, Bob Filner (D) has reportedly signed his resignation as letter from the position of San Diego mayor. The resignation will be a part of the deal from Filner’s side to get the sexual harassment suit dropped. The resignation letter was signed ahead of the city council’s meeting to consider the deal and was secured by former U.S District Judge J. Lawrence Irving who also oversaw the mediation earlier this week. The scandal had been rolling on for the past six weeks as Filner opted to hang on and weather the accusations from 18 women he has worked with in the past and recently. Everything began to crumble for Filner after that as his fiancee and later a staff worker left. The total collapse occurred when the lawsuit by Irene McCormack Jackson, Filner’s former communications director. What followed was a request by Filner’s group to cover his sensitivity training—which he never received even while serving in Congress—and to split the costs of the trial. The latter request was due to Filner’s insistence that it was the city of San Diego’s fault that he didn’t get the required sexual harassment training. On top of the back and forth with the city over legal responsibilities, the news media and late night shows had a field day with the situation and often served it with a side of Anthony Weiner’s woes in the polls. Irene McCormack Jackson (right) presented sexual harassment allegations against Bob Filner on July 22. Also pictured is her lawyer Gloria Allred. The city will take on the responsibility of covering Filner’s portion of the damages to be awarded. The settlement was reached in door mediations that were attended by Bob Filner’s team of three lawyers, city attorney Jan Goldsmith, two deputy city attorneys, and two council members. Monday mediation saw Irene McCormack Jackson being represented by Gloria Allred. The city council is currently discussing the mayor’s resignation and will vote on the terms of settlement today in a closed session. It was just last week that San Diego’s City Attorney Jan Goldsmith stated that there were exit plans in the works for the mayor. One such exit plan was to get a restraining order against Bob Filner to keep him out of City Hall as he created a toxic working environment for women. 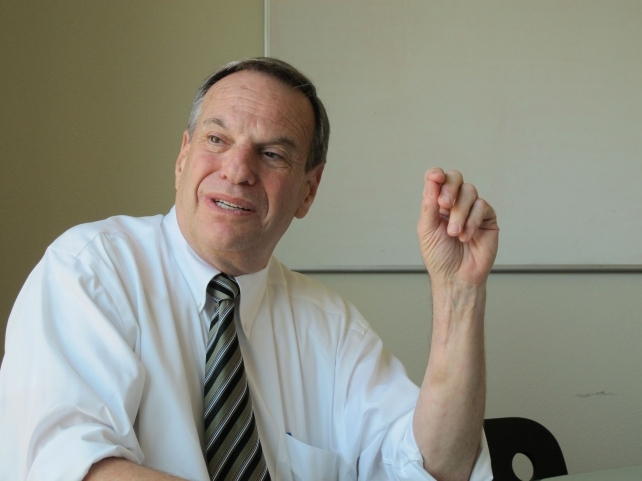 Once Bob Filner is out of office, San Diego will move on to a special mayoral election with the following 90 days.